Importing closed captions via FTP is a great option for users importing a large volume of closed caption files. 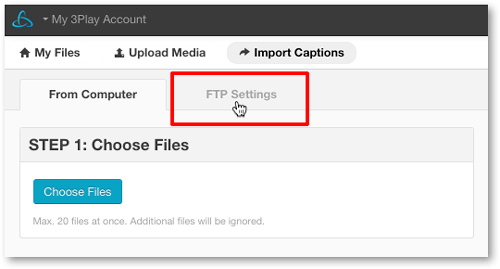 Upload any of the supported caption formats to your FTP account, and our system will detect that file as a import, taking necessary action to convert it to the 3Play system. Imports are processed through a queue so there may be a slight delay before they show up on the My Files page of your 3Play Media project. Imported captions should show up instantaneously, but if the caption files do not show up in the account system within 20 minutes, there may have been a problem with the import process, and you should contact the support team or your account manager. IMPORTANT NOTE FOR FTP IMPORTS: Closed captions imported via FTP will only create “master” caption files in your 3Play Media account. If your intention is to associate imported files with existing 3Play Media files this process can only be done via the account system and not via FTP! Click the Import Captions button located at the top of the page. From the Captions Import page, click the FTP Settings tab. From the FTP Settings page note the connection settings and credentials. Change the Connection Timeout to 120 seconds and click Connect. Create a folder with your chosen name in the FTP client. All files uploaded to that folder will be placed into that folder in your account. If that folder does not exist in your account it will automatically be created. Next add the closed caption files to the folder created in step 6. NOTE: Email notifications will be sent to users regarding any closed captions imported via FTP that are unsuccessful.